I can’t believe I’ve made it to day 10 in the challenge! This challenge is really forcing me to look at my clothes in a new way and think about all of the possibilities. 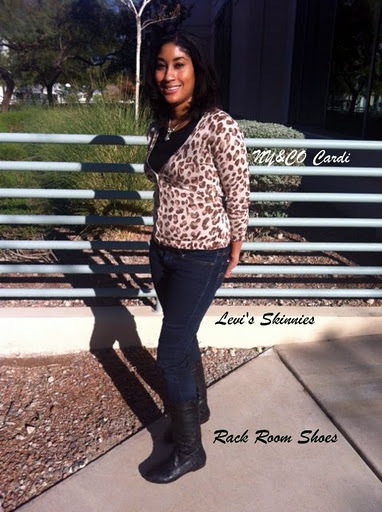 I decided to keep it simple today and wear my adorable leopard print cardi that I got for 50% off at New York and Company. I forgot how much I love that store, I used to shop there all of the time when I worked in banking. NY&Co has an amazing collection of classic pieces for your wardrobe. I paired my trusty Levi’s jeggings with black boots from Rack Room shoes, which are the exact same style as my grey boots. If ain’t broke, don’t fix it right? Hurray! 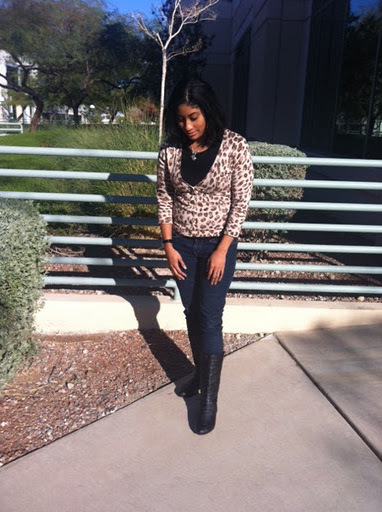 Zesty animal print! Love it.